After waking up, we packed up our things before heading to the refugio for hot showers. Then we went back to the refugio for a breakfast of eggs, ham and bacon. What a great way to start the day in the Chilean backcountry of Torres del Paine! Even nicer news, Jeff thought his knee ligament was feeling better today. We decided to take it slow just in case things started to get rough on him. 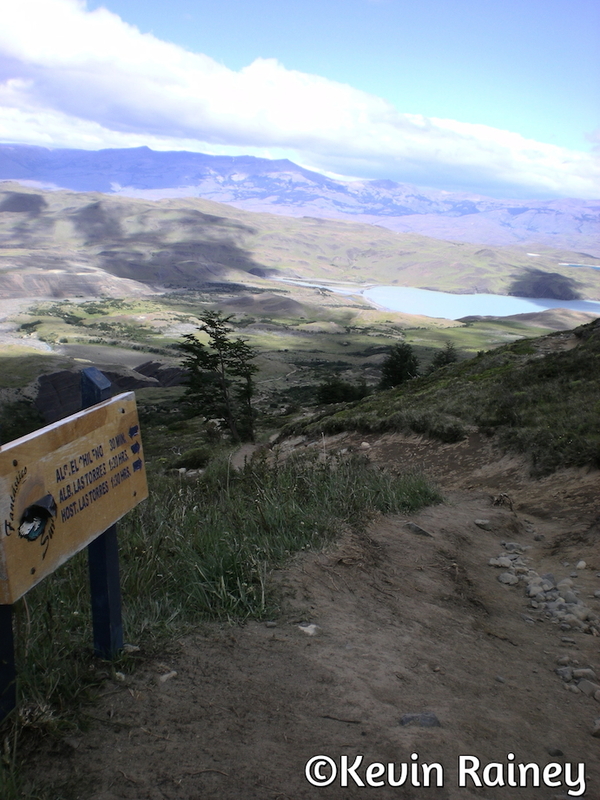 As we left Refugio Los Cuernos and the valley behind us, we began hiking up a ridge. A small group of young Israeli backpackers accompanied us and we passed each other several times as we stopped by scenic meadows and small lakes. As we reached the last V part of the W, we had a great view of Lago Nordenskjöld below us as we hiked up higher. Upon arrival, Jeff’s knee started hurting again so we stopped several times and enjoyed the views up the valley while the Patagonian wind ripped around us. I joke with Jeff about some donkeys we passed and asked him if we needed to get one to carry him. He was not amused. To make matters worse, his hiking boots were disintegrating. One rubber sole was beginning to separate from the body of the boot. I luckily had brought small chord and binder his boot back together for him. One German guy walked by and said “shoe glue, you need shoe glue.” We laughed! As our trail descended from the top of the ridge, we had our first glimpse of Refugio el Chileno deep down the valley at the end of the trail. This was treacherous terrain with the trail looking like it has been wiped out by rock slides multiple times. Alluvial fans of small rocks surrounded us on both sides of the trail, as we peered deep down the steep loose rocks to the river flowing below. 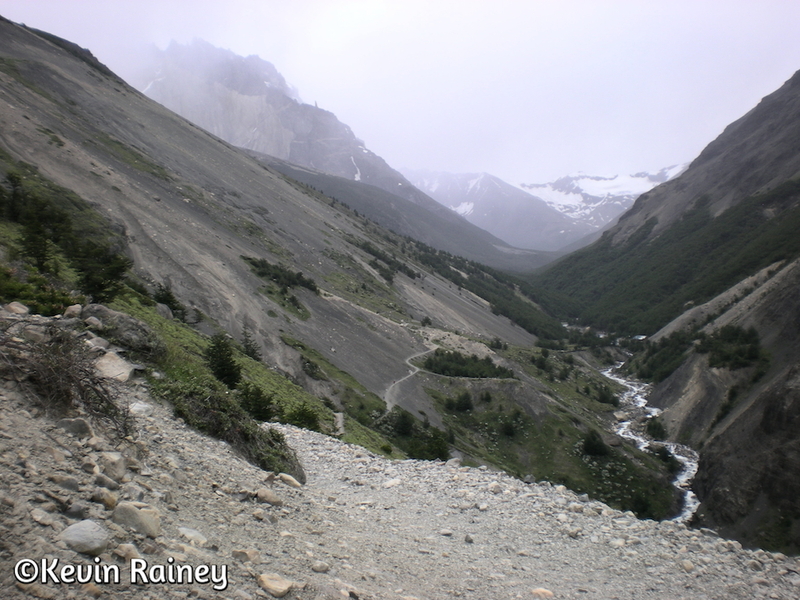 As we descended lower, we crossed the river on a bridge and finally arrived at Refugio El Chileno, which had teased us for so long during the afternoon. After arrival, we stowed our gear in our tent before go inside to check out the refugio. There were some Americans camping next to us from Seattle. Apparently, they had take eight-month sabbaticals from Microsoft to hike the Alpine trail in Europe from Slovenia to France. After arriving back in New York, they decided to fly to South America and wrap up their sabbaticals with a quick trip to hike Peru’s Sendero Inca and the Circuito W in Chile. It was interesting hearing some of their stories during our dinner and learn about how to hike Alpine trail. They said this rivaled any journey they had done in western Europe. Not long afterwards, we went back to the tent for a good night’s sleep.